Teach Flute: It's Better in Color! In 1997 when the Lowell Liebermann piccolo concerto was first published, I happened to be studying beginning piano with Samuel Lancaster. Sam was the pianist with the Colorado Symphony and the composer in residence with the Colorado Children’s Chorale. He was fascinated with the brain and how it collected data, processed it, and then manifested in the process of making music. He studied the brain with leading scientists and his research was way beyond anything that I could grasp at the time. I only remember a fraction of what I learned from him in regard to the brain, and it’s probably because I didn’t learn it on colored paper! Sam began a lesson teaching me about pattern recognition, which I attempted to grasp, and then he went on a tangent about colors. He said that scientists believe that one remembers more when learning in color rather than black and white. According to Aura Hanna, in her paper, The Representation of Color and Form in Long-Term Memory, “…color is part of the long-term memory representation. Subjects performed better when color cues were present at encoding and test. These results are consistent with those of experiments measuring differences in accuracy between colored and black-and-white stimuli.” (p.329). Of course, as a senior in high school, flailing about trying to learn piano for a proficiency entrance exam at IU, I cared nothing about what Sam was trying to impart to me. It was not until I won a concerto competition and needed to memorize the Liebermann that I really did try to allow what he was telling me to sink in. I called Sam in hopes that we could revisit this process that he had taken and developed in memorizing music. Even now, I wish I had paid better attention to his process, but with additional research over the years, the following is what I have learned and cultivated with my own students. Not only is color part of the long-term memory representation in the brain as Ms. Hanna wrote in 1996, it is also widely studied that color is used to represent psychological states. For musicians, expressivity in music is a key factor in a convincing and emotionally charged performance. We cannot hope to pull the music from notes on the page without including a story, image, or emotion. When memorizing, the brain needs as many links to the music as we can possibly give it. Think about it like spokes on a bike wheel, or the 360° viewpoint. How many things can we feed the brain to create a beautiful and polished final product? It needs things like the sense of sight, touch, and hearing, obviously; but it needs intangible things, such as feelings as well. When we use the sense of sight to incorporate colors, we coincidentally include the psychological states, or emotions, as an additional “spoke” on that learning wheel. “While red has proven to be a color of vitality and ambition it has been shown to be associated with anger. Sometimes red can be useful in dispelling negative thoughts, but it can also make one irritable… Red is sometimes associated with sexuality. Yellow is a happy and uplifting color. Green creates feelings of comfort, laziness, relaxation, calmness. It helps us balance and soothe our emotions. We usually associate the color blue with the night and thus we feel relaxed and calmed. Violet is associated with bringing peace and combating shock and fear. Brown is the color of the earth and ultimately home. This color brings feelings of stability and security. Sometimes brown can also be associated with withholding emotion and retreating from the world. Black is mysterious and associated with silence and sometimes death. Too much white can give feelings of separation and can be cold and isolating. So, I embarked on using this fascinating concept of color to memorize the Liebermann Piccolo Concerto. I began by choosing the colors that spoke to me in this piece, and was moved to use red, yellow, blue, green and purple. I felt that those colors helped me create the feelings of angst, happiness, peacefulness, being grounded, and royalty respectively. I then attempted to assign those colors to tone, creatively transform those colors into a story, and ultimately memorize the piece. For me, the red-angst sections meant a more focused metallic sound with louder dynamics, a laser-pointed air stream, and more accented articulations. The yellow, happy sound, was broad with wide dynamic shifts, varied vibrato speeds, more gentle articulation, and a bit more air in the tone than in the red sections. The blue tone allowed me to feel calm and almost ethereal, generally playing with softer dynamics, shimmering vibrato, and a very soft articulation style. Green invoked playing with a stronger core in the body, more support, steady vibrato speed, and a pure tone in the upper register; articulations are deliberate, but not heavy, as is the red sound. I felt that purple was associated with a feeling of power, and so the sound was rich and dark. 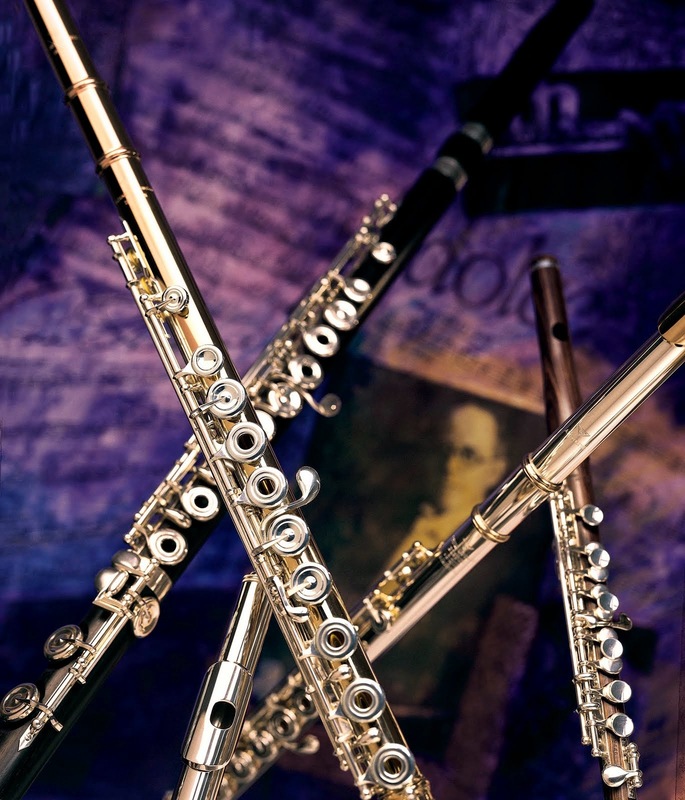 The low register of the piccolo gives that woody sound that resonates through the whole body of the instrument. To do that, the air is aimed lower than normal, with a very open mouth acting as the resonating chamber, and the vibrato is wide and deep. The red sections reminded me of two people having a fight and being in a shouting match. The yellow sections were like the sun coming out after a day of rain, and the exuberance of coming to a realization that had been confusing moments ago. The blue rendered images of sitting on a cloud and looking at a castle. The green gave way for the imagination to climb up Jack’s bean stock, or become the giant himself! The purple elicited thoughts of a king standing powerfully over his kingdom with great responsibility – of course wearing a deep-purple cloak! With those multiple concepts – color, emotion, tone production, a story line, and pattern recognition – I had created enough spokes on the wheel to easily and quickly memorize this piece. The process of deciding what color each section should be only took a few minutes, as did compiling the piece with scissors and tape! But the time it saved me of rote and mechanical memorization was immeasurable. In this way, the story portrayed in a performance can come alive and hopefully stir up something inside the audience’s imagination as well! 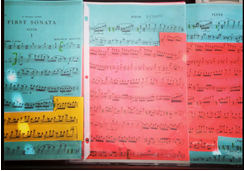 For my students, like Breanna Ohler (see her project below), it creates a really fun and creative artistic outlet, and easily sorts out the massive undertaking of any memorization task. Scientifically, the brain loves the stimulation, and when the brain is stimulated, memory is easily created. Listed below are several fascinating articles below for those who are interested in further investigation. As a special note, I’d like to dedicate this small little token that I have come to cherish to Samuel Lancaster (1945-2013).